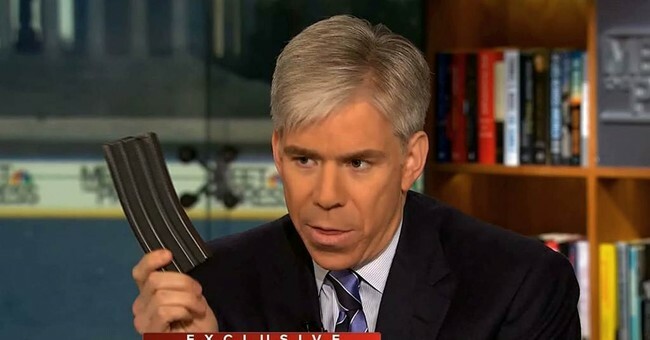 Remember that time when then-host of NBC’s Meet The Press, David Gregory, famously showed a high-capacity magazine on live television in Washington, D.C.? For those you aware of DC’s abysmal gun laws and disrespect for the Constitution, you know that possessing magazines that hold more than ten rounds is illegal within city limits. After the horrific Sandy Hook shooting in 2012, Gregory showed the magazine while speaking with NRA Executive Vice President Wayne LaPierre. This prompted an investigation by DC police as to whether the NBC host broke DC gun laws. The statute is quite clear: “No person in the District shall possess, sell, or transfer any large capacity ammunition feeding device regardless of whether the device is attached to a firearm." The Affidavit demonstrates the facts as to NBC News’ open defiance of the law. This was no innocent error. Yet no prosecution. So, there you have it; gun control acolytes support laws supporting their agenda, until one of their own–you know– breaks them.